The Voyager TRIKE KITS give you the same ride as conventional trikes. The big difference is, when you convert using the Voyager, you'll have enough money left over for five vacations! Sturgis, Daytona Beach, Myrtle Beach, Laconia & Lake George in one year? It's definitely possible with the Voyager. Plus, back to two-wheels in minutes! 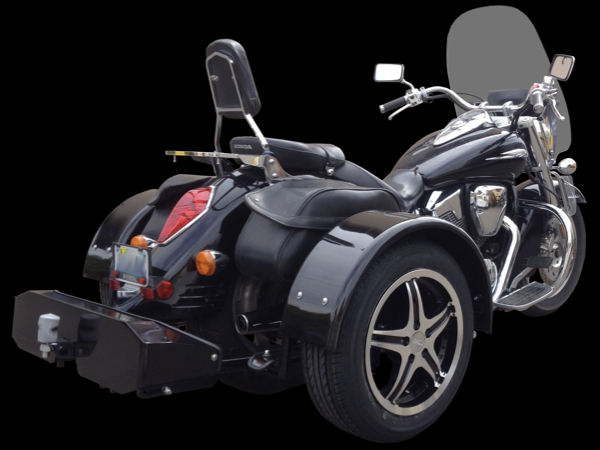 Voyager Motorcycle TRIKE KITS convert most Honda, Harley-Davidson, Kawasaki, Yamaha, and Suzuki motorcycles starting at $3895.00. We also fit a selection of other MAKES AND MODELS!